When it comes to Winnipeg, it’s always a great time to visit! Sure, Winnipeg’s winters may be legendary for the cold, but it’s also the hottest time to host your meeting or convention as our arts, culture, design and theatre seasons are in full bloom. From November through March, when your delegates have a free evening, they can take in multiple shows from performances groups including the Royal Manitoba Theatre Centre – who stage plays at both the John Hirsh Mainstage and the more intimate Tom Hendry Warehouse; Prairie Theatre Exchange – who have a great little venue atop of Portage Place; Theatre Projects Manitoba – whose often provocative performances are housed at the cozy Rachel Browne Theatre; and en français avec Le Cercle Moliere – Canada’s oldest continuously running theatre company. On top of that, your delegate’s senses can feast on performances from Canada’s Royal Winnipeg Ballet and Winnipeg Symphony Orchestra, whose ground-breaking New Music Festival is a can’t-miss – while at pretty much every club, bar and venue downtown you can catch some sort of up-and-coming local or headlining touring band. 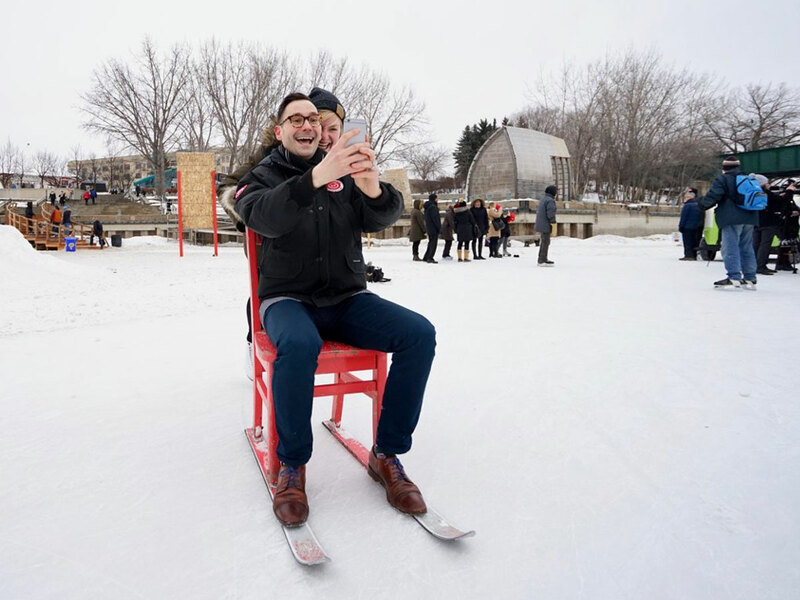 Of course, the hottest action during a Winnipeg winter can be found at The Forks, where thousands of skaters (with rentals available in The Forks Market) take to the Red River Mutual Trail. The Trail is one of the world’s longest skating surfaces, stretching out for kilometres across the Red and Assiniboine Rivers. It features dozens of Warming Huts, the majority of which were created by some of the world’s leading architects and designers. There’s truly nothing else like it across the globe. Should your conference be taking place in February, there is also the opportunity to attend Festival du Voyageur (February 15-24, 2019), western Canada’s largest winter festival. For 10 days FDV brings the fur trade era of the 18th century back to life via costumed interpreters within the walls of Fort Gibraltar, while numerous massive party tents host live music, decadent French food, and more merriment than you thought possible. Spring in the prairies can be a rather slushy affair, which makes it a prime time to discover our great indoors. While the aforementioned (see Winter section) theatre season remains in full swing, there’s also some excellent programming to be found at some of our cultural institutions. For starters, the world-renowned Canadian Museum for Human Rights (CMHR) is featuring a blockbuster exhibit on Nelson Mandela, while the Winnipeg Art Gallery has INSURGENCE/RESURGENCE – the gallery’s largest ever exhibit of contemporary Indigenous art featuring paint, sculpture, installations, and even living tattooing (on until April 22), and some incredible works on display, including David Altmejd’s The Vessel (2011). Of course, both of these institutions are always excellent to visit for their incredible permanent collections and exhibits. Spring also rings in the start of Winnipeg’s major festival season. Of particular note is the 13th annual Manito Ahbee Festival (May 17-21), which is one of North America’s largest Indigenous festivals, where you can witness a massive international three-day pow wow, an art expo, live concerts and conferences, and the Indigenous Music Awards. Winnipeg’s balmy summers provide an ideal time to be hosting a meeting or convention, especially for those of you looking to catch some rays (we’re the second sunniest city in Canada) while enjoying the great outdoors. One of the best ways to see the city is via its waterways with Splash Dash Guided River Tours. Their fleet of pontoon boats take off from The Forks’ harbour on a regular basis (10 a.m. until sunset). Lively captains will regale you with fun tales about Winnipeg’s history while highlighting our city’s many beautiful features from the Red and Assiniboine Rivers. On land at The Forks, a great way to explore the city yourself is on one of the many cool cycles from Bee2gether Bikes. Their forte is tandem bikes, but they also have unique novelty bikes for four persons that can see your group pedalling around the place in style. Bee2gether also has locations in Birds Hill Park and at Assiniboine Park. And speaking of Assiniboine Park, what a gorgeous spot it is – especially in the summertime. Of the many, many activities to be had in this 400-acre park, our can’t miss list includes the Leo Mol Sculpture Garden (which is home to more than 300 works by the celebrated artist); English Garden, where your senses will be enveloped by a fantastic array of flora and sweet smells; Assiniboine Park Zoo – home to over 300 species, including our famous swimming polar bears; lunch at the Qualico Centre while overlooking the park; and strolling the countless tree-lined paths. Festival season is also in full swing during the summer, and a few of our biggest draws are the TD Winnipeg International Jazz Festival (June) and the Winnipeg Fringe Theatre Festival (July 18-29, 2018) – both of which turn the Exchange District into one big block party featuring numerous free shows; Folklorama (August 5-18, 2018) – the world’s largest and longest running multicultural festival where one can go globetrotting via cuisine, culture, music and dance of host nations across the city every night; and the Winnipeg Folk Festival (July), where massive headliners and some of the finest bands you’ve yet to discover play for thousands of people at stages throughout Birds Hill Park. Along with the aforementioned start to our robust theatre and performance groups season (see winter guide), fall is the season when Winnipegger’s tend to close their cabins and get back to business. The kick-off to fall is ManyFest (September 7-9, 2018), the city’s largest block party which shuts down Broadway at Memorial. Crowds in the thousands flock to this event to take part in all sorts of good times including Food Truck Wars, live music, markets, a bike jam, kid’s zones, and yes – many more things. The other big festival-like atmosphere comes courtesy of Culture Days (late September/early October) where Winnipeg continues to host more cultural events within one week than anywhere else in Canada. Culture Days culminates with Nuit Blanche, an all-night free party across the Exchange District, downtown and St. Boniface featuring everything from art shows, to rooftop performances, to all manner of immersive creative experiences. Fall is also the time when Winnipeg’s skies are the busiest – and we’re not talking about planes. At both FortWhyte Alive and Oak Hammock Marsh migration season – which sees tens of thousands of geese, fowl and bird species descend at dusk on the prairies – is celebrated with nightly events including specialty dinners and plenty of birding opportunities. Both places have interpretive centres overlooking expansive wetlands where your senses will be treated by the spectacle and sound of these winged wonders descending in the thousands onto the water.